I mentioned yesterday that I spent some time this past weekend searching for Advent Candles. I had called the Monastery/Abbey Bookstore where we usually purchase our favorite Advent Candles to place an order, only to find out that the monk that usually makes the advent candles only made a very small batch this year, and they only have a couple 3"x2" round sets and one 4"x2" square set, priced at $18.95 per set. My concern is that we would burn through these much too quickly (since we light them for a couple hours each evening). The woman at the Abbey bookstore suggested this lovely set of 100% Pure Beeswax Tapers, but I just love the look and practicality of the Pillar Candles for our family. My search began... First I headed to Autom. I loved this Purple Advent Candle Pillar Set, but I wanted to keep my spending as close to $5 per candle as possible, which is what I have been spending in the past, and it was priced at $24.99 plus shipping. If I hadn't just missed their Free Shipping Offer on Facebook, I probably would have ordered this set. 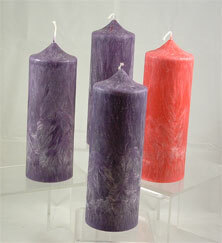 The next set I considered were these smaller 3" Pillar Candles from Catholic Gifts and More. This set sells for only $14.95 and shipping is $5.95 on orders less than $19.99. They also currently have a promotion (I am on their email list and received the email) offering $10.00 off any $20 purchase. This would be a great deal, if you are able to find something else on their site that you would want to order that is just over $5. The promotion expires on November 9th. Yesterday I called Brother David, the monk who makes these candles, at the St. Bernard Abbey in Alabama, and he agreed to ship 2 sets in a flat rate Priority Box (instead of using UPS), which would bring the total to only $19.00 per set. Yay!! I have a couple other friends that are looking for sets, so I might offer the extra set to one of them, or I'll just save it for next year. 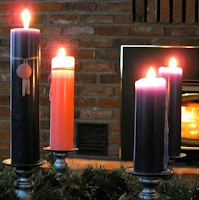 I am so excited that we will have Advent Candles made at a Monastery again this year, and that we didn't need to resort to making our own, or painting some white pillar candles with crayon wax! Note: I did consider this idea years ago, after the idea was shared by a visitor here in the comments, but I have been spoiled by the beautiful Monastery Candles. It would probably be a fun project though, and Lacy has a tutorial that she posted last year. Speaking of crafts, I am considering ordering a set of beeswax sheets for the girls to roll candles as an American History Project. Amazon has this great Beeswax Advent Candle Kit , which comes with enough sheets to create 3 complete sets of Advent Candles (perhaps to give as gifts), and Illuminated Ink also has a lovely Advent Candle Kit as well. So, have you purchased your Advent Candles yet? The kids and I had fun rolling our own candles last year - the kit you show. The only con I had was how fast they burned through. To make it through Advent I would have had to have purchased around 4 sets of them. So if they'll burn them for any amount of time, get extra sheets. I thought about coloring our own candles as well this year and switching to pillars but came across a great holder for tapers at a thrift store this year (every year I keep changing the wreath - and will - until I like it). Yes, the rolled beeswax candles do burn super quickly... My kids just love making them though, so we'll see. They definitely wouldn't work for all of Advent for us, though. We've had the same wreath for years now, which isn't really an actual advent wreath, just a big evergreen door wreath which I stick pillars into for the candles to sit on. We started out purchasing fresh ones, but since it sits in front of our wood stove, and would dry out so quickly, I switched to an artificial wreath. It takes up most of our coffee table, but we love it. Love the pretty, swirly effect of the candles you found. We haven't used the purple/pink candles before & I've been hoping to find some for this Advent. Thanks for posting as you go through your plans - it is so helpful!! Looking forward to your next Little Flowers posts, too :) I just ordered the LF materials for my daughter & we both can't wait to get started. Hoping we will be ready to join in w/the next linkup! Hi Jessica!! I just wanted to invite you to an Advent Link Up at Familia Catolica, hope to see your wonderful ideas there!! I did check out the website to compare prices to Amazon and noticed the extra shipping costs on their website. I love the free shipping deals on Amazon! In the past we have always purchased the sets from Magic Cabin and Hearthsong, but they only come with one sheet of each color - along with the templates for various ways to roll the candles. The Toadily set will make 3 sets if you cut the sheets to create tapers. If you roll the sheets whole (as it is shown in the second picture) it won't make the three sets. Looking at the description a little further it says that the sheets are 8" x 16 1/2" so I am guessing that they would be cut in half to create the tapers, which would result in one extra half of the purple. The sets from Magic Cabin come with 12 - 8" squares for $19.95 plus shipping, so the $30 for 9 - 8"x16" pieces is basically the same cost per sheet! I can't thank you enough for always making things a snap for me! Thank you so much of all of the links. 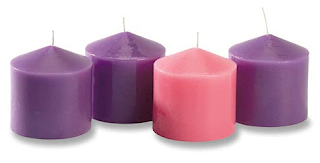 I have been looking for Advent pillar candles for years. If you ever do have trouble finding pink/purple sets, I have used white candles and circled them with colored ribbon. You can use tacks or glue to hold the ribbon and move it down as the candles burn. I am so glad that I clicked on this post. I haven't been able to find pink candles at all for the past couple of years (I live in Japan), and I got a couple of good ideas on how to remedy that problem. How wonderful to be able to get candles from a monastery - but, I'm thankful that we have Ikea over here now, so that at least I can get purple and white! I also just wanted to mention that I love your blog. I love getting ideas from you, since we are recent converts, however I have had a hard time lately because your blog uploads very slowly. I'm not sure if it's a problem on your end or mine, but I thought I'd mention it just in case there is any remedy that you know of. I often get a message saying that a plug-in has crashed (though it doesn't name the plug-in). Just thought I'd mention it. Thanks for sharing the link. I ordered the pillars yesterday - can't wait for them to get here. We always make advent wreaths at our church(a wonderful gift from our parish to be able to do that) but the tapers are ususally gone quickly. My mom goes to the Abbey every year on her birthday (weekend) for a retreat in the end of September, and usually picks them up for me then, but Father hadn't made any yet this year. I waited a few weeks to call back, and guess I shouldn't have! I'm glad that you were able to get some to use for your family! Have a wonderful and blessed Advent! We only burn ours during dinner - and our wreath is designed to hold tapers anyway. . . but a thought to keep in mind is to purchase candles on clearance after Christmas. Granted, I had never thought to get mine from a monastery or convent. . . but if the source is not an issue, I got mine on clearance last year at Yankee Candle and put them away with the Christmas decorations. Sue ~ I went through the plug-ins on my sidebar and deleted a few that might have been problematic. I hope it makes a difference!